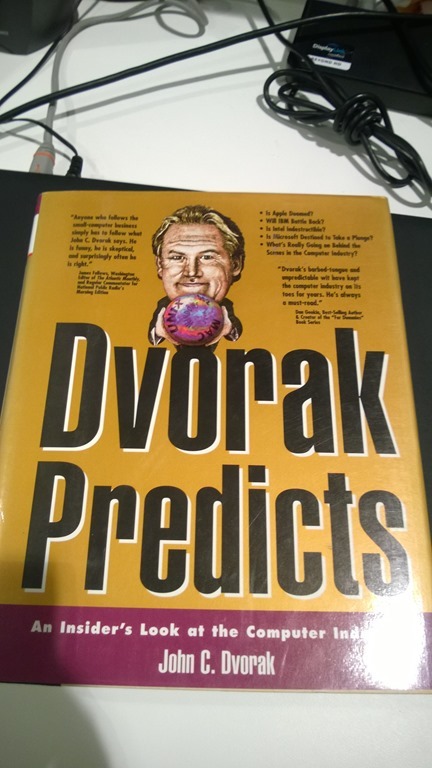 A technology pundit & journalist, John C. Dvorak, once wrote a book back in 1994-ish called “Dvorak Predicts” in which he made a series of gloriously hilarious predictions. I know this because in my early 20’s I spent a lot of time in the local Barnes & Noble and parsed through all sorts of real winners on the computer bookshelves. Back then there was a gut of publishers like Que, SAMS, Wiley, O’Reilly, Sybex, etc. just cranking out books as fast as they could… because the public was buying up tech books like crazy. And a good barometer of how successful a product was was based on how many 3rd party books were written about it. One could say that, with the writing of this book, Dvorak was simply capitalizing on that trend. Folks were looking for the next big thing, and a book “predicting the future” might provide a glimpse into what that “big thing” was. Even though it ended up being horribly inaccurate. Anyway – back to Dvorak’s predictions: Let’s celebrate a few of the doozies here, shall we? This one’s like shootin’ fish in a barrel and a history lesson all in one. I have to believe Dvorak was simply blinded by his religion for OS/2 and this chapter was just wishful thinking on his part. Windows at the time of publishing was already showing signs of taking off with Windows for Workgroups 3.11 and the availability of the free “TCP/IP-32bit for Windows” (codenamed “Wolverine”) was single-handedly pushing networked Windows into the stratosphere and killing the business of companies like Wollongong, Hummingbird, and other folks that actually SOLD TCP/IP stacks. I grew up in both Silicon Valley as well as with Financial Services. And I grew up in a IBM family to boot: I knew only one guy that used OS/2. And he was from IBM. And he had the same technical religion around the product as Dvorak did – while ignoring the fact that things like developer ecosystem, hardware partnerships, marketing, and evolutionary transitions, all are equally important elements to the success of a product. Technology historians reading this one probably just spit up their coffee. For the millenials in the audience, Windows NT was the first true multitasking, microkernel based operating system that Microsoft produced & it thrived so much that it evolved over the last 20 years to eventually became the Windows 7 & 8 that we know today. 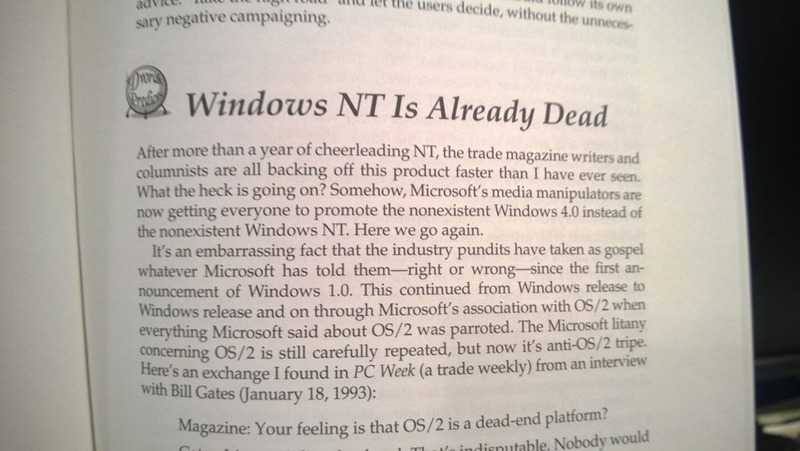 To reiterate how off this prediction was, Windows NT improved year over year to become the core of the #1 computer operating system in the world. 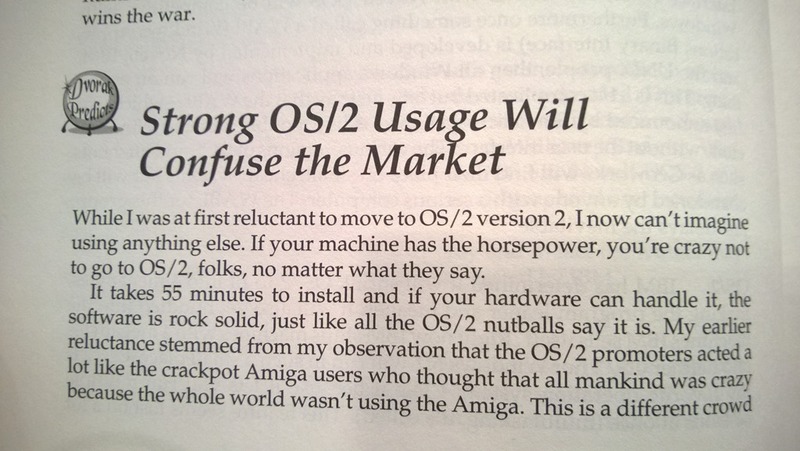 One can only chalk up Dvorak’s words to his pro-OS/2 bias and his apparent thinking that for OS/2 to success, Windows NT must fail. Again, technology religion and his adoration of RISC’s purported elegance is likely what spurred upon this ‘prediction’. Dvorak was a huge supporter of all things RISC and if you really want to get technical, ARM chips, the processors that power virtually all smartphones & the majority of tablets in the mobile world, is a RISC derivative so one could say that RISC “won” in terms of volume. 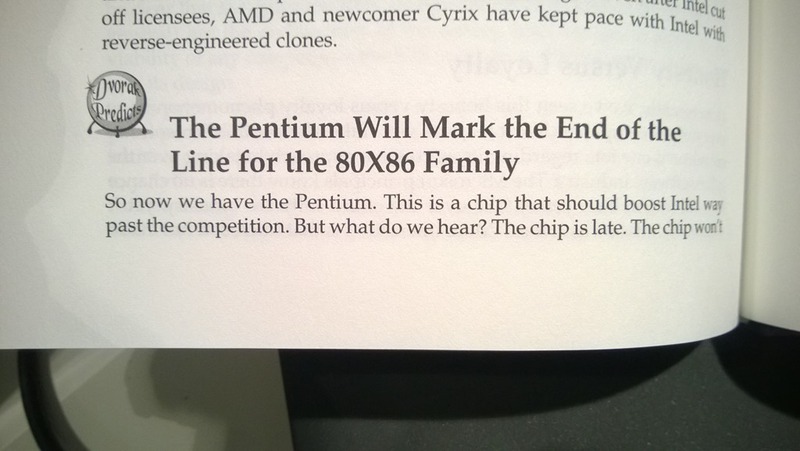 But Intel’s x86 line of CISC processors never “ended” in deference to RISC architecture and that was the context in which he wrote this statement. I saved this video to my desktop. To remind myself. This 3 Minute Video Made Me Cry, And I Never Cry. Must See For Everyone. You are currently browsing the Kurt's Thoughts blog archives for April, 2014.